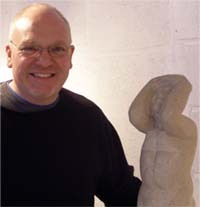 Jonathan has been commissioned for sculptures to be sited both at home in the UK and more distant locations, in America, Scandinavia and India. Jonathan has had experience of team leading in commission projects. This includes his work at York College where he is a Course Tutor in Art & Design. Here Jonathan led successful programmes of student commissions over the past 15 years for clients such as York and District Hospital x-ray department, The York Viking Festivals, and sculpture trails at Hardcastle Craggs in West Yorkshire. The commissioning process usually involves initial informed discussion, to cover material, siting, scale, finish, costings and timescales. Usually the next stage involves creating drawings or macquettes, with more detailed considerations of the finished work, transportation and installation, and a meeting at the artist's studio for a viewing, and modifications made if required before the sculpture is started. Large scale projects usually require a deposit of 20% and staged payments, with final balance payable before the sculpture is transported from studio to site. 2008 "Approaches to Sculpture in the Landscape" International Sculpture Symposium, Leeds University. 1983 Cat Sculptures for fourteen York buildings, including offices, Kings Square, Mothercare, Coney Street, Tom Adams Design Associates Offices, St.Andrewgate, Riverside Lodge Water Fulford Hall, and Lendal Chambers, Lendal, York 2004 and ongoing. 1984-87 Chairman and founder member of York Artspace Association: organising studio space and exhibitions for artists in the North of England.